It wasn’t the compendium of facts in the chapter “Water! Water! Water!” or indeed in the entire book. It was that Carey McWilliams wrote about Southern California with sensibilities my eye, ear, and nose recognized. Along with Chandler he made me feel that he’d not only walked down the same streets and into the same arroyo-he smelled the eucalyptus, heard the humming of high tension wires, saw the same bleeding Madras landscapes-and so a sense of deja vu was underlined by a sense of jamais vu: No writers had ever spoken as strongly to me about my home. The rapacious effects of a housing development in Deep Canyon nearby, and a photo essay called “Raymond Chandler’s L.A.” in the old West magazine provided, I think, the actual catalyst for the screenplay. The photos in West-a Plymouth convertible under an old streetlight in the rain outside Bullocks’s Wilshire, for example-reminded me there was still time to preserve much of the city’s past on film, just as McWilliams had shown me that it was my past as well. 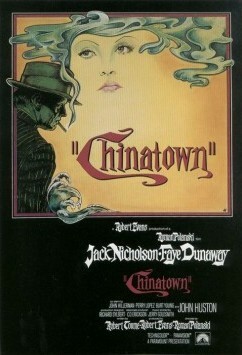 —Robert Towne, writing for the Los Angeles Times (circa May 1994) about Chinatown, LA literature, and finding remnants of an older version of the city—in junk stores, garage sales, the warm dry itch of the Santa Ana wind, winding streets at dusk, and of course the work of McWilliams and Raymond Chandler. Towne wrote the screenplay for the 1974 film, which was directed by Roman Polanski.